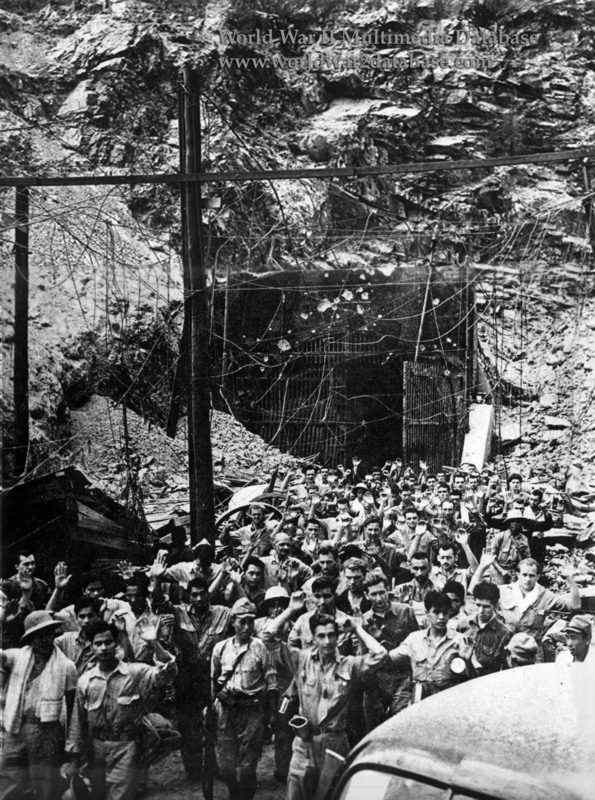 Japanese propaganda photograph restaged the mass surrender of American and Filipino soldiers and sailors in front of the West Entrance of Malinta Tunnel two days after the actual surrender. The exact layout and capabilities of the tunnel was a military secret when it was finished in 1932. Built on a shoestring budget because of the naval treaties forbidding fortifications, Malinta grew into a massive network of "laterals" including a hospital for 1,000 patients. In 1941, fearing attempts by a Japanese bomber to either crash-dive or skip-bomb the tunnel entrance, the wired fencing in the top of this view was put up to detonate or stop any attack before it reached the tunnel entrance. This photo, while probably staged on May 8-9 for the Japanese press, shows the terrible effect of the Japanese siege. Almost 22,500 shells from thirty-seven batteries of 100mm cannon (4 inch), 150mm cannon and howitzer (5.9 inch) and 240mm howitzer (9.4 inch) fell on Corregidor during the siege, carving out large piles of rubble and wrecking almost every above-ground structure. Intensive air bombing of Corregidor continued through the siege. On the night of May 5-6, 1942, the 1st and 2nd Battalions of the Imperial Japanese Army's 61st Regiment, under Colonel Gempachi Sato. Despite heavy casualties, they captured Battery Denver and infiltrated snipers behind American lines, threatening Malinta Tunnel's 1,000 hospital patients. Brevet Lieutenant General Jonathan M. Wainwright IV (August 23, 1883 - September 2, 1953) ordered the colors lowered and burned and a white sheet signaling surrender run up instead. Japanese press arrived on Corregidor the day after the surrender. Many Americans participated in this photo because they were told they would be seen back home, and it was a way to communicate to their families that they were alive. Identified in the photo - next to the car facing a Japanese solider - Sergeant William R. Sanchez (July 18, 1918- ), 59th Coast Artillery Regiment; in front of him, hands over his head, Corporal Harry Corre (May 1, 1923- ) Wheeler ("C") Battery, 59th Coast Artillery Regiment; and next to Sanchez, Private Max McClain (April 11, 1922-October 7, 2005) "K" Battery (Browning .50 caliber (12.7mm) machine guns; McClain crewed searchlight No. 5), 59th Coast Artillery Regiment, who is pointedly not offering his hands up. Sanchez and Corre would meet decades later, never knowing they were photographed together or even that they served in the same unit. Corre was captured on Bataan, escaped during the Death March and swam to Corregidor on a makeshift raft he built. After recovering in the Malinta Tunnel Hospital, he joined "C" Battery and was reformed into infantry just before the Japanese landed on Corregidor. He was in Malinta Tunnel rushing to reinforce the 4th Marine Regiment when the Americans surrendered. Sanchez, Corre, Sanchez and McClain were marched through Manila to Bilibid and then to Cabanatuan. Corre, sick with Diptheria, was sent to Fukuoka Camp No. 17 after recovering, months after Sanchez and McClain left. Sanchez was sent to Pusan, Korea and then Shinagawa, Yokohama; eventually he was sent to Omori Camp and was in the hospital when he was liberated. McClain was sent to Mukden, Manchuria, where he endured biological experiments from Unit 731; he saw several friends die after receiving injections. When he returned, people doubted his account of the experiments. This view was published in Yomiuri Shimbun in May 1942 and again in a victory retrospective published a year after Pearl Harbor. Corre became an advocate for former prisoners of war, helping 350 former prisoners gain 100% compensation. Sanchez also advocates for prisoners and gives talks to schools. McClain supervised finishing metal alloys used by the National Air and Space Administration's Mercury, Gemini and Apollo programs.